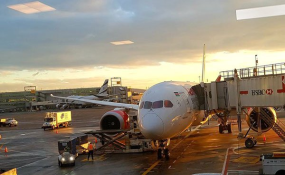 The Kenya Airways plane leaving Jomo Kenyatta International Airport on Sunday night in Nairobi will be seen at the John F. Kennedy International Airport in New York, United Stats, on October 29th , 2018. Normal flights from Kenya to the US take up to 22 hours for the 11,849-kilometer route between Nairobi and New York. President Uhuru Kenyatta said shortly before departure that the direct flights will open Kenya to the rest of the world. "It's a historic moment for Kenya's aviation to witness that the first direct flight between Nairobi and New York has finally started, and the direct air connection between our country and the US offers great opportunities for trade, tourism and human relations" he wrote on Twitter. Kenya Airways is the first airline to offer nonstop flights on flights between East Africa and the United States. The airline already serves Africa, Europe, the Middle East, the Indian subcontinent and Asia. The national airline shared a video about the landing at JFK on Twitter with a welcome by the traditional water salute. The social media platform congratulated members of the public of the airline, General Director Sebastian Mikosz and Captain Joseph Kinuthia, who flew the plane. Mr. Mikosz and KQ Chairman Michael Joseph thanked the President for supporting the airline.